The 2017 Pegasus Award finalists have been announced. The Pegasus Award is given by the Ohio Valley Filk Fest and for excellence in filking. Anyone in the filk community can vote on the winners, and community is broadly defined — check out the rules here. Whether or not you vote, enjoy the sound clips of the nominees here. The ballot is here. The last full day to vote is October 15. Jordin Kare (1956-2017), respected science panelist and filksinger, died July 19, having never recovered from surgery to replace his failing aortic valve. An astrophysicist who worked on the Clementine lunar mapping mission and developed the Sailbeam propulsion concept, Kare received his B.S. in Electrical Engineering and Physics from the Massachusetts Institute of Technology in 1978 and Ph.D. in Astrophysics from University of California, Berkeley in 1984. I went into astrophysics because I was interested in the large-scale functions of the universe, but I went to MIT because the hero of Robert Heinlein’s novel Have Spacesuit, Will Travel went to MIT. He said that as a child, he went to a science camp and learned how to build a laser. When he got his laser to turn on, he had an epiphany and was absolutely sure that he wanted to work with lasers for the rest of his life. Kare and Thomas Nugent of LaserMotive won $900,000 at the Space Elevator Games in 2009. Theirs was one of three competing teams which built prototypes designed to climb a one-kilometer cable held aloft by a helicopter. Kare explains how LaserMotive won in this video. As a filksinger he published two albums, Fire in the Sky (1991) and Parody Violation: Jordin Kare Straight and Twisted (2000). His song “Fire in the Sky” received a Pegasus award for Best Classic Filksong in 2010 and has been quoted on national television by astronaut Buzz Aldrin. Kare also was an editor of The Westerfilk Collection: Songs of Fantasy and Science Fiction, an important filksong collection, and later a partner in Off Centaur Publications, the first commercial publisher specializing in filk songbooks and recordings. Kare’s first convention was Boskone 1975. He and his future wife Mary Kay met for the first time at Denvention (1981) after she admired his writing in the Filk Foundation zine. He was the brother of Susan Kare, designer of the fonts and icons of the original Apple Macintosh user interface. He has been Tuckerized in several sf stories. An astrophysicist character with his name appears in two of David Weber’s Honor Harrington novels, War of Honor and Torch of Freedom. Jordin and Mary Kay were Tuckerized in Callahan’s Touch by Spider Robinson. By Carl Slaughter: The first time I interviewed Vixy and Tony, we talked about the nature of filk music. Since then, they have released another album and added 2 band members. This interview is focused on the band itself. Carl Slaughter: What albums and songs have you come out with lately? What were the inspirations and what are the themes? 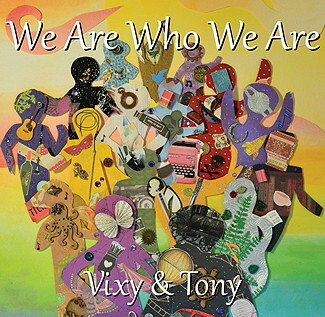 Vixy & Tony: Our most recent album, We Are Who We Are, is our second full album, and we’re very proud of it. Since Betsy and Sunnie (or cellist and fiddler) have been in our band for a while now, we’re happy to finally have a full-length studio recording that features them. The inspirations and themes are different for each song, but each song tells at least some kind of a story of its own. Of course, being filkers, all the songs are related to SF/Fantasy/Mythology, SF fandom, or geekdom in some way, though some are more directly relevant than others. 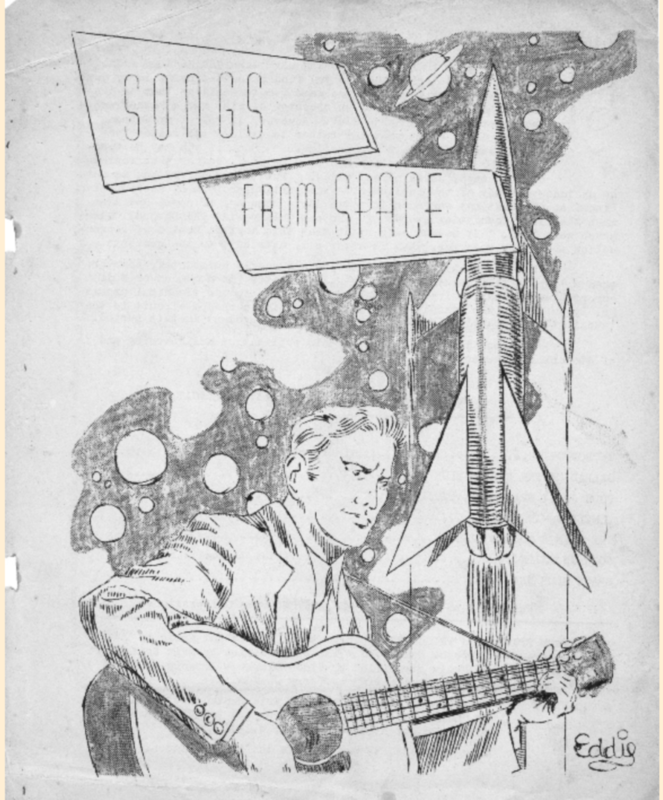 It’s got a space ghost pirate ship story (our cover of the filk classic “Dawson’s Christian”), a song about an astronaut (“Anna”), and a love song for a cosplayer (“We Can Be Anything”). Some of the tracks are a bit more personal, like “Burn it Down”, which is about overcoming your fears, or “The River”, a song geeking out about songwriting. The title track, “We Are Who We Are”, is our geek anthem and social justice anthem. If I had to pick a single thematic thread for the album, it would probably be something like “fight the good fight” or “keep at it”. CS: What exactly is an Outdoor Trek. What do the fans do there? What does the band do there? V&T: Oh, we love Outdoor Trek very much! There are a few groups throughout the country who are turning old Star Trek TOS episodes into stage plays and performing them outdoors, Shakespeare-in-the-Park style. Portland had “Trek In The Park” for a while, and in Seattle we’ve got Outdoor Trek, and it’s wonderful. For a few weekend afternoons each summer, you can go to a local park in Seattle and watch a wonderful gender-bent version of a TOS episode performed. The cast is wonderful and funny, and they play up the inherent humor and silliness of the whole thing, but they clearly do it with a love and deep respect for the source material. These are true Trek fans who love the original series, but at the same time, aren’t afraid to laugh about it. Their low-tech prop gags are the best: phasers which are clearly just garden sprayers, and transporters which are just hula hoops with gold ribbons tied on. Their Horta from “Devil in the Dark” was epic. They usually have an actual “house band” doing the theme music and incidental music, live, along with the play. We’re not the house band, though some of our friends have been in the house band from time to time. Our part of it is simply to be an opening act once in a while. We don’t get to do every one because our schedules are pretty busy during the summer, but we try to open for Outdoor Trek on one or two afternoons each year when we can. Details about Outdoor Trek can be found here. Vixy and Tony. Photo by Angela Sather Hodgetts. CS: What exactly is a fen? What happens at a FenCon and what does the band do there? V&T: “Fen” is simply the plural of “Fan”, intended as a bit of a pun (Man->Men, Fan->Fen). It specifically refers to people in SF/Fantasy fandom as opposed to, say, fans of a sports team or a band. FenCon is a Dallas regional SF convention, usually held around September each year. This year we’ll be the Music Guests of Honor there, and we’re very honored that they’re having us. We’ll play a concert, participate in filk circles, and if we’re lucky, possibly appear in other musical performances with some of our friends who are slated to be playing there as well this year. 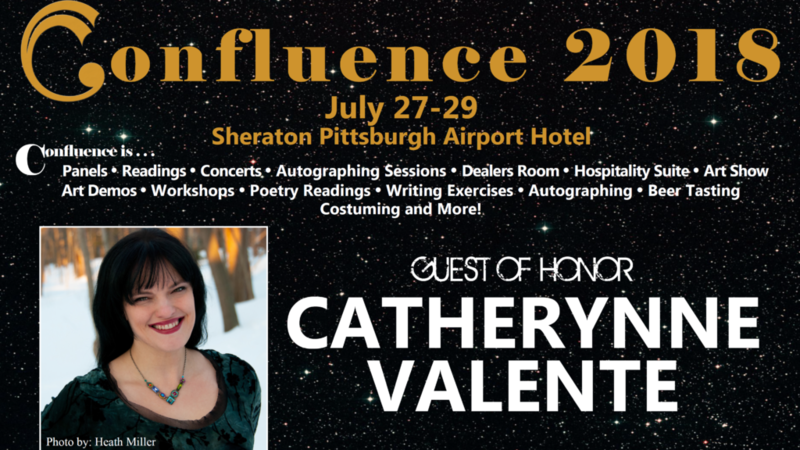 For me and Vixy and Sunnie, it’ll be our first time at FenCon, but Betsy has been there before (as the cellist for Tricky Pixie) and she said it was great, so we’re really looking forward to it. CS: You just got back from Norwescon. What happened there? V&T: Norwescon is our Seattle regional SF con, held every spring on Easter weekend, and it was really fun this year. We got to play a really fun concert in one of the big ballrooms. Apparently we outgrew the “two adjoined smaller rooms” that we usually play in each year, so they moved us up to the “big hall”, as it were. I think we played a great set, and we also got to see our Portland friends The PDX Broadsides play a great set, too. They just finished up their Kickstarter for their new album which is going to have some great songs on it. Of course the rest of Norwescon was fun as well, they have a great programming track every year, full of super interesting stuff. A lot of our friends do panels there every year. The con tends to overflow the hotel every year, so there are many, many geeky people there all weekend. The costuming is top-notch too. CS: Same questions for Conflikt, and is there any actual conflict? V&T: There is indeed conflict at Conflikt, there’s one particular conflict that the name refers to. That’s our Pacific Northwest regional filk convention, and Vixy and I were there on the day it was initially conceived. We were at a housefilk in Victoria BC several years ago, when some of the folks there got the bright idea to start our own PNW filk con. Beth Runnerwolf was there with us, and she had been doing a great job running the filk track at Norwescon at the time, and we figured she’d be a great programming chair. The only problem was that when we started looking for a good weekend on the calendar to hold the convention, we couldn’t find a weekend that wasn’t already adjacent to some other nearby fannish event. Every weekend we could think of conflicted with something else, so that’s the name that stuck. And then we made a joke in the title/logo that only proofreaders and copyeditors will get. Eventually they settled on the weekend immediately prior to the annual the UK filk convention, thinking that the attendees for a con in WA and a con in the UK would, by their very nature, be from different geographical groups and thus those two cons wouldn’t conflict very much. Of course it never works out that way. The third year, Vixy & Tony ended up being GOHs at the UK filk con, so we played at both Conflikt and at the UK filk con on back-to-back weekends. It seems like every year there’s at least a few people who are attending both cons back-to-back. Crazy, but great. This year we were the “toastband” at Conflikt, which is the same thing as being the “toastmaster” except there’s four of us to do the job instead. We had a great time, as we do every year we attend. CS: What happened at Music Under the Trees? BTW, why trees and which trees? V&T: Music Under the Trees is an annual house concert put on by our cellist, Betsy Tinney. Betsy is quite popular because she’s a wonderful cellist and complete sweetheart of a person, and as a result, she plays in a lot of different bands. Most summers, schedules permitting, a lot of her connected bands get together to play for an entire afternoon and into the night. It’s sort of a mini music festival where Betsy gets to play her cello in every act. It’s held in her backyard, which has an amazing little amphitheater tucked into the woods behind her house, hence the name. Though she’s not doing it this year, due to other things in her family’s schedule this summer. Hopefully it’ll be back in 2018. CS: What’s the connections between your music and Firefly? V&T: We love Joss Whedon’s work, and Firefly is our favorite. It’s a richly detailed universe that’s full of interesting characters and stories and possibilities which never got fully explored due to the series’ tragically short run. We’ve written a couple of Firefly songs, and we’ve got friends who have also written some Firefly songs which we like to do covers of. Vixy’s most popular song, “Mal’s Song”, on our first album, came about because she loved the Firefly theme song, but felt like it was too short. It seemed like the chorus of a song without any verses, so, she wrote some verses to go with it. “Missing Part”, on our latest album, is about Kaylee, and it’s written by our good friend Seanan McGuire (who just won a Nebula award, by the way). It’s one of my favorite tracks on the album. I learned how to play slide guitar just for that song. CS: You’re involved in various production projects with various other bands. Tell us about some of those. 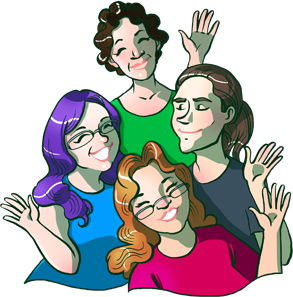 V&T: We’ve got a lot of filk and geek music friends, and we really enjoy mixing it up with them. Vixy seems to always be singing harmony vocals on someone’s album, and I’ve been known to produce the occasional song or two or three or album for someone we love. Most recently, we’ve been the backing band for Molly Lewis, including her hilarious musical Thanksgiving Vs Christmas, I co-produced “Mischief” with SJTucker, and Vixy is on some wonderful recent releases by Jeff and Maya Bonhoff and Mary Crowell. Listing all of Betsy and Sunnie’s other projects would take forever, but check them out at http://betsytinney.com/recordings/ and http://sunnie.org/. CS: Do you do workshops and panels and such? Do you branch out into traditional folk festivals and such or do you stick with the speculative crowd? V&T: When we play at a convention, we do indeed do workshops and panels. We like to do home recording workshops and performance workshops when we can. Being part of the fandom community and trying to share knowledge and experiences is a big deal to us. 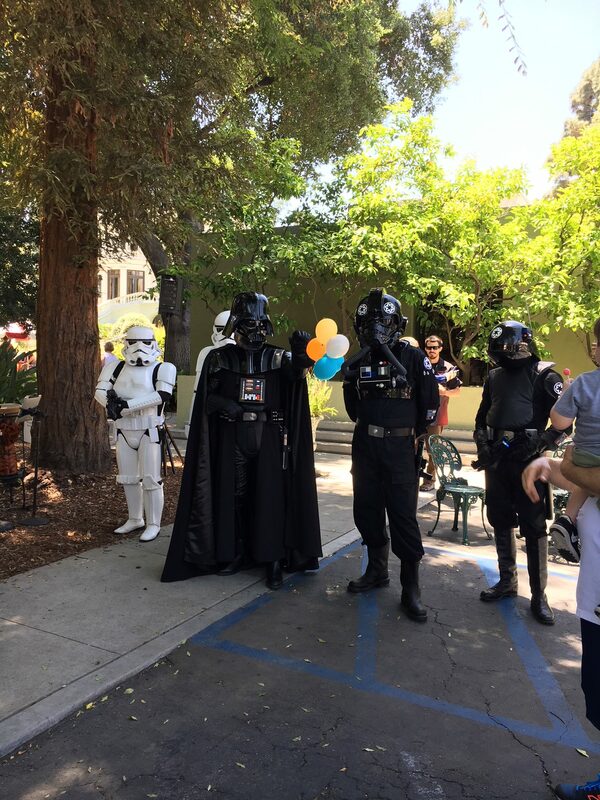 We haven’t tried playing traditional folk festivals, we tend to prefer SF/filk cons and smaller venues where our particular audience can find us. For example, I’ve been to the Bumbershoot festival here in Seattle, it’s huge and it’s wonderful, but it’s just insane, I couldn’t imagine trying to be one of the acts there. We’d get completely lost there. It’s much more rewarding to play our geeky songs to a much smaller group of geeky fans. CS: What exactly is Rock Band, approximately how many hours a week do you spend playing it, and are there any conventions/contests? V&T: Heh, that reference on our web page was a little joke about the video game, the one where you use toy guitar controllers to poke colored buttons in time with the music. It’s basically Dance Dance Revolution but without the dancing. 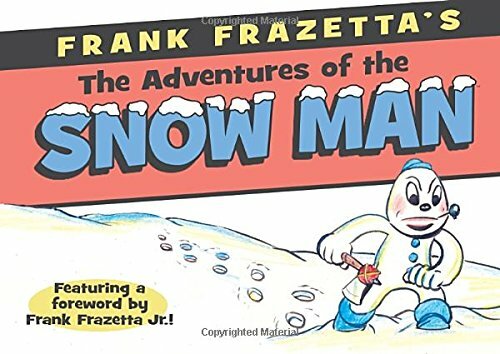 It was a huge novelty when it came out, and we had a lot of fun with it for a quite a while. Seanan stuck in a reference to it when she wrote the Bio page for our website. We actually haven’t played it in some time, though the guitar controllers are still hanging next to the TV. There was a point in time when they were letting people put up their own indie music on Rock Band and making it available for download. I was about to put “Six String Love” up there, but then I discovered just how amazingly tedious and time-consuming it is to author the song files for it. I got halfway through the process and ran out of steam. I seem to recall reading that they’d stopped the indie music submissions for it a while back, so I don’t even think that’s an option for us anymore. CS: One of your award songs is “The Girl That’s Never Been.” Didn’t quite understand it, but it seems to have a strong speculative element. Something to do with Alice of Wonderland fame. Give us the inside story on the lyrics. V&T: “The Girl That’s Never Been” is essentially a direct musical interpretation of an existing short story called “The Cheshire” by Bill Kte’pi , which is itself a sort of an alternate interpretation of Alice’s story. It follows a common theme: Imagining what it might be like for someone who’s gone through an amazing, mind-bending, life-altering experience, but then has to return to a “normal” existence. In a situation like that, no one believes you and you can’t possibly explain it to anyone in a way that they can understand, and now the “real” world seems less important than the other world. At the start of the story, Alice is older, and she’s been seeing shrinks and been having drug and alcohol abuse issues as she tries to deal with the cognitive dissonance. I can’t really say more without spoilering the ending. CS: Your band size has doubled. Who are the new additions and how do they fit in? Do they always accompany you on tours? Why additions? Weren’t you getting booked and winning awards as a duo? V&T: We really don’t know how we ever survived without Betsy and Sunnie. They elevate our music to a new level, and we don’t ever want to play without them again. We have so much fun together, and we love how we fit together as a band. We started playing with them only occasionally, adding a bit of cello here and a bit of fiddle there, at times when our bands were playing back-to-back sets at the same venue. Soon we started cross-pollinating each other’s bands regularly, and before we knew it, we realized that we really couldn’t live without them. Playing as a duo is a different kind of a show than playing as a four piece, and the four piece is so much more amazing and full and energetic. When you play with other good musicians, it makes the music more interesting and intense, even when you’re talking about simple arrangements to the same songs. The core of the songs hasn’t really changed, but the songs are fundamentally different now. The way we perform them and the way you experience them is forever altered by our new lineup. It’s like the old saying “a rising tide lifts all boats”, where everyone in the band plays better and becomes better musicians through the blending of everyone’s uniqueness. We are trying not to play any more shows as just a duo. It’s certainly more logistically complicated for us to play as a four piece, but it’s really worth it. Maybe we play fewer shows because of it, but the shows that we do play are always memorable and joyful experiences. CS: What exactly is a Pegasus award, how many wins/nominations do you have, for which songs, and against which competition? 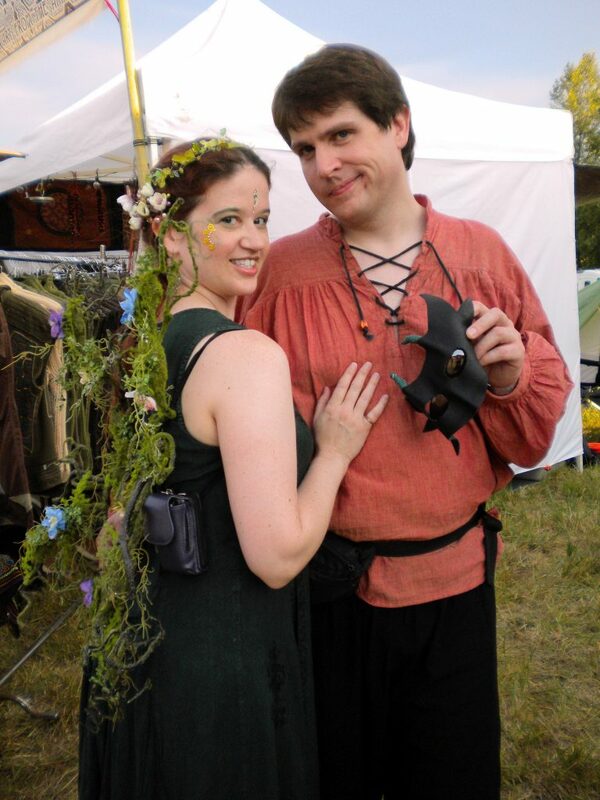 CS: You’ve been together for over 10 years and have been singing filk for over 15 years. What’s the explanation for your endurance and that of your music. 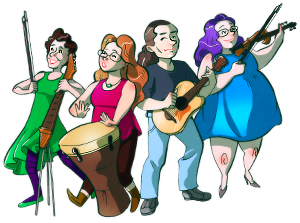 V&T: Music in general, and filk in particular, is something we do for fun, and we do our best to keep it that way all the time. We try not to turn it into “work”. We have day jobs, so we’re lucky that we don’t need to depend upon writing and performing constantly. If we did, we’d probably burn out pretty quickly. We’ve got friends who are professional musicians, so we can see what that life is like, and we know it’s not for us. Betsy is probably the band member whose life is most strongly aligned to being a career professional musician, but even she does her best to keep everything fun and interesting all the time. As long as we all keep it fun, only writing what we want to write, and only playing where we want to play, it will always be something that enriches us and keeps going. Hopefully some of that shines through in our performances and recordings, helping to make them fun for everyone. CS: Who writes the songs and what’s the songwriting process? V&T: For the older songs, before we teamed up, Vixy wrote everything: Music, lyrics, arrangement, all of it. But that was very hard for her, doing it all by herself, so after we teamed up, now we have a pretty good collaboration system: Vixy writes the lyrics, and then we collaborate on the music. Usually we start with a first draft of the lyrics, sometimes just a verse and a chorus, then decide upon an overall style for the song. Then I start coming up with chord progressions on the guitar, based on the desired style. She gives me feedback on the way the chords fit the lyrics, and we make changes to the chords to fit the lyrics or vice versa. She will either come up with a melody based on the chord progression, or, sometimes she will already have parts of a melody in her head, and I will write chords which fit that melody, and fill in the gaps. Sometimes I will make a suggestion to change the melody to fit the chord progression I wrote. Occasionally I€™ll write sections of words or melodies myself, or provide suggestions for the lyrics in spots. Frequently we will collaborate on the verses and choruses but she will leave the bridge up to me (she calls me her Civil Engineer because I make her bridges for her). Then we bring the song to the rest of the band, and the real magic happens, where we sculpt the song from a raw framework into something full of interesting details. Betsy and Sunnie add their parts, and then we play off of those until things start to cement in place. There are parts of the songs which were created by Betsy and Sunnie which are now inseparable from the songs, such as Sunnie’s wonderful violin intro to “We Can Be Anything”. CS: How has your music evolved? V&T: I like to think we’ve become better songwriters and performers over time. Adding Betsy and Sunnie to the band has given us a richer sound and a more detailed presentation of the songs. We’re tending to write songs with the whole band in mind, since now we can do things like play extended instrumental sections that we couldn’t have done before. And on the occasions when we want to do cover tunes, we can do more interesting variations on them. CS: What’s on the Horizon for Vixy & Tony? Gifted filker Renee Alper died July 27 from an infection. She was 57. Alper discovered Tolkien while in the fifth grade, an interest which in time led her to fandom. She developed severe arthritis after starting college and was forced to drop out. During a year-and-a-half of enforced inactivity, she read a notice that The Mythopoeic Society was forming a group in the Chicago area. She responded and helped found Minas Aeron in 1977, together with Michael Dorfman, and Greg Everitt. A wire service story about the new club attracted out-of-town Tolkien fans to join, prompting them to rename their group the American Hobbit Association. The organization soon had more than 200 members, most from the U.S., but several from England, the Netherlands, and Hong Kong. They also recruited Christopher Tolkien, Clyde Kilby, and Raynor Unwin. The AHA newsletter was named Annuminas (West Tower) and they later published The Rivendell Review. The group continued to meet locally for 12 years. Alper also wrote locs to many sf fanzines and was one of the first subscribers to File 770 in 1978. Arthritis confined her to a wheelchair most of the time, but her physical challenges became much greater in February 1989 when she suffered a devastating spinal cord injury in an auto accident. While on the way home to Cincinnati, after a day trip to visit her boyfriend in Columbus, the vehicle she was in skidded on a patch of ice and crashed off the side of the road. She broke her neck in numerous places, and was in a halo brace for the next six months. She adds that psychotherapy, with the right therapist, was an indispensable tool to her recovery. Alper became a teacher, a singer, songwriter, public speaker, actress, director and playwright. She used her experiences to write a play about a disability support group, Roll Model, and “Non-Vertical Girl” (2009), which presents her life story as a one-woman musical fringe show. “Non-Vertical Girl” follows the heroine from the onset of a lifelong illness as a teen, through a devastating car crash, and ultimately to love and success. Alper began with a review of all the terms used over the centuries to refer to someone with limited use of their limbs, which changed over time as each came to have a negative connotation: crippled, invalid, handicapped, disabled. She chaired Cincinnati Playwrights Initiative’s Cold Readings and also read for the Cincinnati New Light Festival. Other Alper works were produced by the Cincinnati Fringe Festival (“Extreme Puppet Theatre”), Talent2000USA (“Roll Model”), and The Renegade Garage Players (“Roll Model Jr.,” “Trust,” and “The Rescue”). I liked saying “I am the dramaturg, I speak for the text” — you know, “I am the Lorax, I speak for the trees.” Because where the author deviated from the text, I basically said yay or nay, but he didn’t always listen. The biggest faux-pas he did was having Sam and Rosie get pregnant before they were married. I hopped up and down, waved my hands, did everything I could, but he kept it in the play. Alper was a devoted and talented filksinger. Dave Weingart, another leading filker, credited her with having “a wonderful voice”. 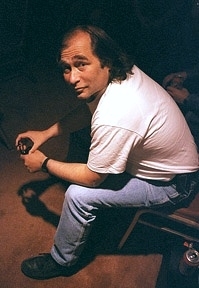 Alper also won or placed in the Ohio Valley Filk Fest Songwriting Contest nine times from 1991-2003, with songs like Reed Turner: Novel Hero, Deer John Letter, If I Were a Rich Fan, and Tear It Down. She produced several tapes, including Wheelchair in High Gear, Four On the Floor, and Thoracic Park. For a time, she hosted Filkaholics Anonymous at her home in Mason, OH. She was a GoH at Musicon 2 (1993) in Nashville, Tennessee. Alper even had connections to gaming fandom. Gamerati did a video interview with her in 2011. If there is an exit interview for life, I have a few suggestions for the customer service department…. 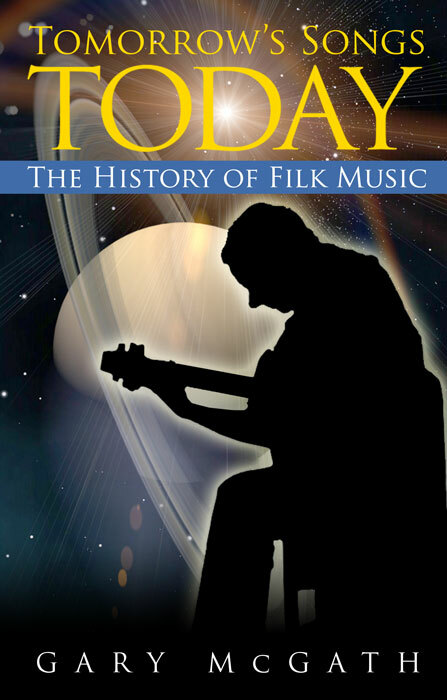 Gary McGath’s fanhistory Tomorrow’s Songs Today: The History of Filk Music, funded by an IndieGoGo campaign, is now available as a free download. I’ve really enjoyed the portion I’ve read so far. What’s this thing called “filk music” that’s sung at science fiction conventions? It’s a culture with a rich history, a community that transcends national borders. It’s dreams of space and science. It’s laughter and sadness. It’s the people who create and sing the songs, who publish them, who organize conventions. Author McGath has been active in filk since 1989. He has chaired three ConCertino filk conventions and has run Boskone’s filk program for two decades. He was inducted into the Filk Hall of Fame in 2004. McGath has also edited several filk songbooks. 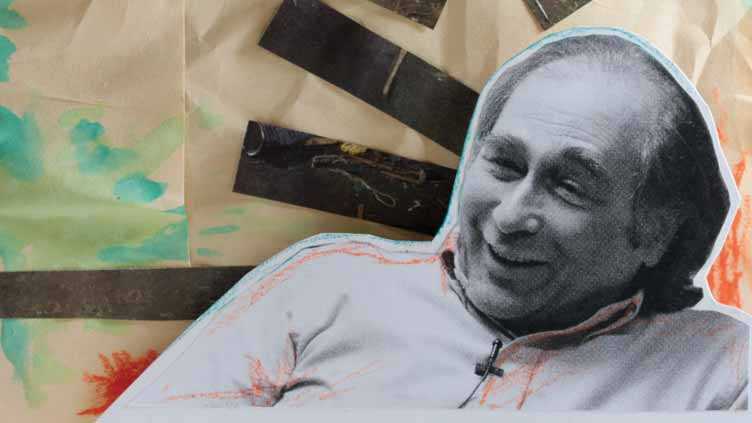 Tomorrow’s Songs Today is rich in anecdote, the product of many interviews with longtime filkers. 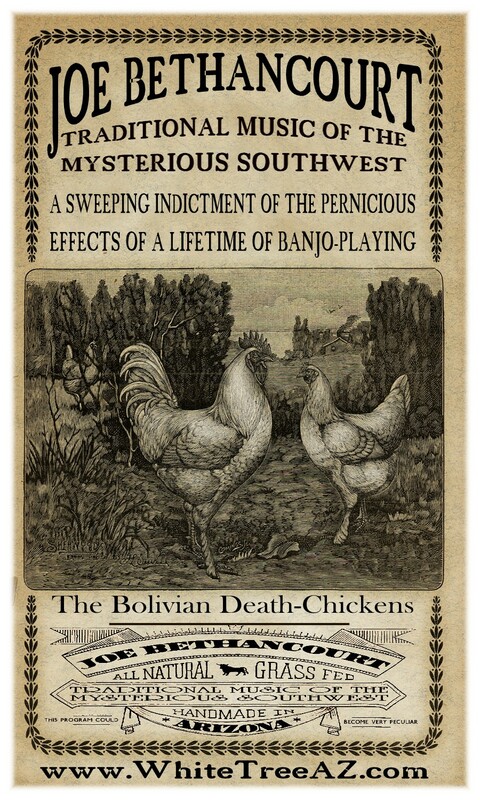 I can’t claim much knowledge of this specialized field but the book bats 1.000 in reporting the only three facts I know to check: filk was a typo by Lee Jacobs, Poul Anderson wrote the lyrics to “Bouncing Potatoes”, and the field’s best-known fanzine, called Philk Fee-Nom-Ee-Non, was a Hugo nominee in 1984. Check it out – after all, the price is right! Joe Bethancourt performing in 2004. W.J. 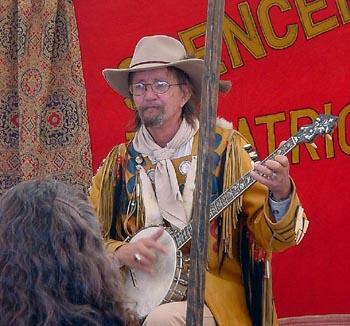 (Joe) Bethancourt, a professional bluegrass singer with roots in filk and the SCA, died August 29 after a long illness. Bethancourt joined the Society of Creative Anachronism, probably at the 1969 Westercon — the only date that fits with the rest of the official history — and was instrumental (pun intended) in founding Arizona’s Kingdom of Atenveldt where he was known as Master Ioseph of Locksely. He was one of the first to receive the kingdom’s “Order of the Laurel,” in April 1970. And he later held the office of Imperial Herald. Bethancourt ran his own production company, White Tree Productions, and recorded solo, with noted filker Leslie Fish, and with the neo-Celtic band The Bringers. He taught acoustic instruments of all kinds out of Boogie Music in Phoenix. He played 65 different instruments – banjo and 12-string guitar and the rest of a long list including 6-course Cittern, Celtic Harp, Lute, and Ozark Mouthbow. His professional musical career included a stint as a studio musician in LA before returning to Phoenix where he worked 17 years performing at the Funny Fellows restaurant, hosted a radio show on KDKB “Folk Music Occasional,” appeared regularly on local TV on the “Wallace and Ladmo Show,” and worked with children in the Arizona Commission for the Arts’ “Artists in Education” program. In March of 2013 he was inducted into the Arizona Music and Entertainment Hall Of Fame.